There's plenty of excitement at Bentley Motors these days, and not all of it comes from the marque's recent victory at Le Mans — a victory that ended a 73-year drought since the Bentley Boys last stood atop that podium. But the new Continental GT, much like that win at Le Mans, is largely the result of Bentley's parent company, Volkswagen. For longtime fans of the brand, such an arrangement could be viewed as blasphemous. Having the storied British marque owned and controlled by Germany's largest automaker may not represent what W.O. 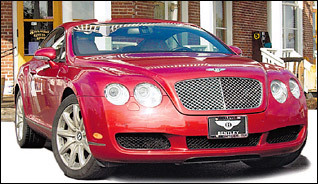 Bentley originally planned when he started his company over 80 years ago. However, the 2004 Continental GT coupe is the most exciting vehicle to wear that famous "B" emblem in 70 years. Not only is it the best Bentley ever made; it's arguably the best ultraluxury coupe currently available. The $150,000 Continental GT won't go on sale in the U.S. until March, yet demand is already outstripping supply for the next two years (Bentley plans on selling 1,500 a year to U.S. customers). Even the press vehicles are difficult to come by, but we were recently given the unique opportunity to drive a Moonbeam Silver model from Los Angeles to San Francisco. Over the course of one day, we experienced the vehicle in a variety of conditions and came away with one clear impression — at $150,000, this car might be considered a bargain! We didn't arrive at such a conclusion lightly. When you consider the tremendous vehicles available for anywhere from one-half to one-fifth that price, it's hard to justify a $150,000 car in today's world. But consider the competition from Aston Martin, Ferrari and Mercedes. The Aston Martin Vanquish costs $225,000, yet it makes "only" 460 horsepower, offers only rear-wheel drive and has various interior materials that don't live up to its nameplate — or price. The same description holds true for the Ferrari 575M, except it makes 515 horsepower (and carries only two people). The Mercedes-Benz CL65 AMG ups the horsepower figure to 612 while costing a mere $200,000, but it's still only a rear-wheel-drive car, and many might argue that a Mercedes nameplate simply doesn't compete in the same realm as Bentley, Aston Martin and Ferrari. Now consider the Continental GT with its 552-horsepower W12 engine, four-passenger seating, all-wheel drive and nearly faultless interior. As one Bentley representative told us, "When I was first told the selling price, I reexamined the car to see what they left out to sell it so cheap. Damned if I can't find anything missing." After spending some 400 miles in the Continental GT, we found one or two minor sticking points, but, overall, we feel the same way. The first item we should point out is that this vehicle is being badged as "the fastest four-passenger coupe" in the world. With an official rear seat and a top speed of 198 mph, that claim at first seems accurate. But like so many past and present coupes, the rear seat's functionality is open for debate. We stuffed a six-foot staffer back there for a 20-minute drive and confirmed that the seat is comfortable and headroom isn't an issue, but unless the front passengers are relatively short, rear-seat legroom is radically reduced. When the front seats are adjusted all the way back (which is close to where our six-foot driver placed the seat for maximum comfort/control) rear-seat legroom is suitable only for a baby seat-mounted infant. The next item that some might consider "left out" on such a car is the availability of a true Formula One-style manual transmission. The Continental GT offers only a six-speed automatic transmission, though it includes paddle shifters just ahead of the steering wheel that are as easy to utilize as those in the Vanquish and 575M. The transmission can be set in a sport mode for more aggressive automatic shifting, or a Tiptronic mode for manual shifting via the paddles. The latter mode proved highly entertaining, with responsive upshifts and downshifts that felt almost as pleasing as what we have experienced in the SMG-equipped BMW M3. We've always felt the AMG-badged Mercedes products offered the world's best automatics, but this one is at least as good, and the user-friendly paddles give it an edge over Mercedes' steering wheel-mounted buttons. The wow factor continues inside the Bentley coupe where the interior materials and control layout conspire to create one of the best cabins we've ever sat in. This is not surprising when you consider the parent company's penchant for great interiors. If $34,000 buys an Audi TT's interior, and $65,000 gets you an A8's interior, you can imagine what Volkswagen-Audi is capable of producing for $150,000. Real metal accents and supple leather throughout the cabin highlight the old-world design elements, such as the push-pull vent controls and deep-set gauges. Even the door-mounted window switches and the levers for pushing the front seats forward are made of real metal. As impressive as the interior materials are, it's the successful melding of technology and functionality that makes driving the Continental such a pleasure. Without ever cracking the owner's manual, we quickly mastered the climate control system, audio system, suspension settings and even the TV functions (the TV feature won't be available on U.S.-market models). Bentley uses an iDrive-like wheel to scroll through the car's many functions, but it combines the wheel with multiple buttons that allow fast access to each of the car's major systems. Each control function also features a graphical element that clearly displays what you are doing in the center stack area. The "instant access" buttons mean that, unlike iDrive, it takes only a few seconds to adjust any of the hundreds of climate, audio and performance settings (are you listening, BMW?). The audio system was particularly impressive, with multiple surround sound modes that feature digital signal processing and sound quality as clean and sharp as the best Mark Levinson systems from Lexus. Like all German products, the Continental GT doesn't have an in-dash CD changer, but at least the changer is in the glovebox and not the cargo area. And, as we mentioned, our test model had a TV function that worked surprisingly well for a non-satellite system (but only when we were in large cities). The video portion of the TV system wouldn't display when the car was in motion but like the car's other systems it was extremely easy to figure out and use. There remains the most important aspect of a high-end luxury coupe: how does it drive? To put it simply (and to drive our high-school English teachers crazy), we can confidently say, "It drives good!" Once again, think Audi in terms of sublime steering feel and effective suspension tuning. The Continental GT weighs in at a hefty 5,300 pounds, but you'd never guess it after flinging the car through the twisties or hammering it to quickly merge with freeway traffic. The car's air suspension has multiple settings for comfort or performance. The coupe's ride height is also adjustable to aid high-speed stability, and a rear spoiler deploys from just below the rear window to create down force. Wind noise is minimal at 80 mph, and the Bentley feels buttoned down at nearly twice that speed. Maximum torque from the W12 engine is 479 pound-feet, and it's available at what many cars use for a warm-up idle setting — 1,600 rpm. The coupe feels as quick as that output would suggest, and Bentley claims it will hit 60 mph in just 4.7 seconds. Yet the car's all-wheel-drive system means traction is never an issue. Goose the throttle from a standstill and you'll forget about the twin turbos squeezed under the car's short hood as it leaps forward with minimal effort. Braking is similarly effortless as the floating calipers squeeze 15.9-inch front rotors and 13.2-inch rear rotors. A short acclimation period is necessary to appreciate how powerful the system is, but feedback through the pedal is superb and confidence in the car's stopping ability builds quickly. In many areas, the Continental GT has set new benchmarks. Its interior quality and control layout are as well executed as anything we've driven. Its combination of comfort, performance and luxury is unprecedented. And then there's the price, which as we said before could rightly be called a bargain at $150,000. Maybe that teenager in Templeton had it right all along: "Wow." Sweet i was waiting for a review cuz i was kinda on the fence about buying this car. Not bad, but I would get an AM DB9 over the GT any day of the week. I wonder what they mean by "a true Formula One-style manual transmission" - F1 uses paddle-shifters. IF you can remember the original Bentley Boys, you may still carry a torch for Clara Bow (or Rudolph Valentino) and look forward to Charleston Night at the senior center. To put it bluntly, you've been around the block a few times since Bentley's legendary drivers won the 24 Hours of Le Mans in five out of seven starts in 1924-30. Impressive as those feats may have been, Bentley surely got its money's worth in publicity from the wins, refusing even today to give its long-ago (and long-dead) heroes a rest. Bentley never misses a chance to promote its high-performance heritage, even though its last notable successes - aside from recent efforts featuring cars with Audi racing engines in Bentley bodies - occurred nearly 80 years ago. A lot has happened to Bentley since then. It was acquired by Rolls-Royce in 1931, and in the intervening decades the cars have generally been rebadged Rollers with more powerful engines, different grilles and a dollop of sporting pretension. While there is a Rolls-Royce Owners' Club for aficionados of the Flying Lady, the corresponding organization is the Bentley Drivers Club; this suggests that those who motor in cars with the winged B on the nose live more dashing lives than the swells who commute in the back seats of chauffeured Rolls-Royces. Volkswagen obtained the Rolls-Bentley operations in 1998 and gave up Rolls to BMW in 2003. It ended up with little more than the Bentley name and logo, an outdated factory and faded bits of history. VW's challenge was daunting: to remain true to the Bentley spirit while creating, for the first time since 1930, a car that was more than a Rolls with an attitude. The first new Bentley to stand on its own is the Continental GT, which went on sale this year. If this four-seat coupe is to be judged a success, it must not only sell well, but must demonstrate the proper Anglo-Teutonic alchemy of style, comfort and performance - three touchstones of what a Bentley should be about. The Continental GT is a striking car, from its impressive front grille to its taut haunches. Its 12-cylinder engine, unusual in having a W-shaped configuration rather than a V-design, pumps out more than 550 horsepower thanks to dual turbochargers. Bentley says the car accelerates from a stop to 60 m.p.h. in 4.7 seconds. (Car and Driver recorded 4.9 and Motor Trend 4.5.) The top speed is said to be 198 m.p.h. Volkswagen's involvement in the Continental GT has extended well beyond writing the checks and supplying technical and managerial skill. This may be an expensive and rather exclusive automobile, but there is a lot of VW under its skin. In today's automotive world of shared platforms and borrowed drivetrains, even a sticker price of $162,285 doesn't necessarily mean the car gets a bespoke chassis - or even distinctive air-conditioner controls. In this case, the chassis, powertrain and many of the interior switches are shared with the GT's cousin, the four-door VW Phaeton. While both cars have superb driving characteristics, the Bentley looks expensive and exotic, while at first glance the Phaeton could be a Passat on steroids. During a week with the Continental GT, I was constantly surprised by how many people knew what it was. At my local supermarket in Portland, Ore., the bag boy asked, "Is that a Bentley?" When I confirmed his guess, he responded, "They are so cool." Cool, yes. If the overstyled Rolls-Royce Phantom has become a symbol of the garish hip-hop lifestyle, the Continental GT is bling-bling for wealthy car lovers with taste. Despite its derivative drivetrain and controls, the GT can be judged on its own merits. Without question, it is a sleek, high-performance machine, a technology showcase and a car designed to be driven quickly. One cannot fully appreciate its abilities in urban driving, so I headed east of Portland on Route 26, past Mount Hood and the rest of the Cascade Range, into the high desert region of central Oregon. This sparsely populated area, laced with challenging roads and packed with scenic delights, extends for hundreds of miles. The Continental GT is a thirsty car. After 175 miles in which I averaged about 14 m.p.g. on the Interstate - and considerably less on secondary roads - we stopped for fuel in Fossil (population 399). While gassing up the GT, the station attendant pointed to a sheriff's cruiser up on jacks outside the shop. "That's the only police car in Wheeler County on duty this morning, and it's got two flat tires," he slyly volunteered. "I'll guarantee you that it will be at least two hours until that car is back on the road, and there are a lot of good roads around here." Unwilling to let the opportunity go to waste, I pointed the Bentley onto Route 207; the 40-mile stretch of road from Fossil to the Painted Hills overlook consists of long, straight sections linked by tight switchbacks announced by 30 m.p.h. warning signs. The harder I pushed the GT, the crisper it handled - and the more the big car seemed to shrink. Despite its considerable weight (5,358 pounds) the Continental GT seemed to delight in being driven like a sports car. I entered each turn quickly and waited until the last instant to engage the huge vented four-wheel disc brakes. Once through the tightest part of the turn, I fully depressed the throttle. The thrust of the 6-liter engine rocketed the car forward, shoving my companion and me back in our seats. There was little body roll or lean; the GT felt tight and crisp. This Bentley has perhaps the most perfect steering feedback of any car I've driven. All pavement imperfections are transmitted through the wheel, yet without any steering column shake or disturbance. The driver feels an immediate and informative connection with the road. At very high speeds there is some noise from the windshield pillars, but in ordinary cruising all is hushed. The electronic suspension is adjustable. Though the standard setup is good, the firmer settings offer improved road-holding but are not so stiff that you risk having your teeth shaken loose. The suspension lowers itself at high speeds and is manually adjustable otherwise; we found it useful to raise the car when traversing a gravel road. The design has many subtle and appealing touches not evident on first inspection. For instance, a crease around the front wheel arch becomes flat with the body at the top of the wheel well and then reappears on the back side of the opening. The grille is suitably imposing without being a caricature of itself (unlike the monolith on the front of the Phantom). The rear lights, along with a retractable spoiler, are ingenuously integrated into the body. The Continental GT is not a small car by any means, though in development it was known internally as M.S.B., for midsize Bentley. Indeed, compared with the massive R-Type and S-Type Continentals of the 1950's, the new car seems 20 percent undersized. Sometimes at promotional events, Bentley displays the new GT alongside those vintage coupes; it might be better off leaving the old cars at home so they don't overshadow the new, smaller GT. The interior is a nearly perfect blend of high technology and old English style. The walnut veneer is quite attractive, and tasteful chrome bezels around the air vents are reminiscent of vintage Bentleys. The navigation system is the same as the Phaeton's, and it is just as confounding here. Because it is CD-based (not DVD-based), eight discs are required to cover the United States. At least the CD's come in a handsome leather case embossed with a proper winged "B." The 400-watt, 12-speaker Siemens stereo is spectacular. Driving home from a touring production of "Little Shop of Horrors," I played the soundtrack. In "concert hall" mode, the system faithfully reproduced the overmiked, artificial sound that typifies today's Broadway shows. And once again proving that European manufacturers think little of Americans' tendency to sip liquids on the road, the cup holders are hidden in the center console, under the armrest. To use the side-by-side cup holders (which, by the way, won't hold two 12-ounce cups at the same time), you must raise the console lid and lose your armrest. It is annoying to be forced to make this kind of choice in a $162,000 car. The back seat is nicely appointed, with a console in the middle and separate controls for lighting and temperature. But when I adjusted the front seat to fit my 5-foot-9 frame, there was less than two inches of space between my seatback and the rear cushion. Bentley says the interior is designed so that a family of four can travel in comfort. This might be true if the driver and front passenger have day jobs as jockeys and their offspring are similarly diminutive. The six-speed automatic transmission was remarkably adept at choosing the right gear for any situation. You can shift manually with a pair of paddles on the steering column. But the paddles do not turn with the wheel, making shifts while cornering into complicated maneuvers. In a hurry, it's easy to grab the turn-signal lever on one side, or the wiper stalk on the other, by mistake. With the Continental GT, VW's goal was to reinterpret - in fact, to reinvent - a long-quiescent English marque. It has succeeded. Though built on a German platform, using a German drivetrain, the Continental GT clearly benefited from having the right sous-chefs in the kitchen. The coupe has the look and feel of an elegant, hand-built classic GT car, but thanks to the technology inside, it performs like a modern exotic. While the jury is still out on VW's upscale Phaeton, lagging sales and cut-rate leases suggest that the huge sedan, which sells for $70,000 to $100,000, may prove to be a costly failure. But consider this: It was the technological investment in the Phaeton that ultimately made the Continental GT so alluring. Proud owners of the new Bentley should tip their caps each time one of those oversize Passats drives by. INSIDE TRACK: Scones and strudel, speed and style. That is one of the sickest cars on the road today. The interior is absolutely amazing. I had the chance to "drive" one, meaning i parked it for a friend of my grandpa. but i did get to start the engine, put it in gear, and then move it about 20 yards. If you've got the means, it is definitely worth it. One thing that is annoying about the CGT is that there are VW insignias scattered throughout the car (on various parts). yeah, id rather have a comparable rolls. Yeah, the CGT is basically a Phaeton 2 door that's why......lot of parts shared. If you flip over the Bentley oil cap, VW is stamped underneath (for example). Also, a number of parts (ex. suspension components) are stamped "Audi." The key is the same as an audi, VW. So, there is no mistaking the CGT for a VAG product. Yeah, its a cool car.......I would still go for the DB9 though. I think the DB9 looks more sleek. Interior, as with most VWs, is where the Bentley is king, though. The DB9 is so much nicer IMO.. I've seen a few of the Bentley GT's on the road recently and while they are nice, I'm much more of a fan of the DB9. pretty much the same for the hp/weight ratio and the 0-60 is almost identical. I guess that knowing someone that has driven numerous Aston Martin's and have been told many times how they lack pick-up, I would like to go with something that has a few more horses under the hood. VW talk aside, I saw a GT down in Fla (outside of Sanford, Osteen Maytown Rd) coming towards me. It's EASILY one of the most beautiful cars on the street. Saw one on the road before...It's a nice looking car, but for the price tag, there are other equally nice cars. If I win the lotto I will buy one. I don't think so. There aren't to many "equally nice" cars... not by a long shot. Here for the first time are prototype shots showing the open-air version of Bentley's top-seller, the Continental GT Coupe. It was caught during hot-weather testing in California. The British luxury carmaker Bentley - owned by Volkswagen since 1998 - has been very successful in particular with the GT Coupe. The factory in Crewe had to increase the number of employees continuously to meet the demand. The waiting list in the United States is so long that customers will wait over a year and a half before they take delivery. The convertible's launch is scheduled for 2006. Rumours had it that - because of the strong sales of the hardtop version - it could be delayed for some time due to capacity problems, but the ready-for-production-look of this prototype hints they're close to the original schedule. The new GT Convertible is reminiscent of the legendary Bentley T Drophead Coupe that came on the market back in 1971. It should be the world's most powerful and fastest four-seat convertible ever. But I do like what I see! definitely, there's not that much room in the back seat of a GT. Early this morning, Bentley Motors announced the introduction of the Continental GTC. The new luxury 2+2 convertible completes the Bentley Continental model range following the introduction of the highly successful Continental GT in 2003 and four-door Continental Flying Spur earlier this year. The new Continental GTC goes on sale in late 2006. With a top speed in excess of 190 mph (304 km/h), an all-wheel drive system, 12-cylinder engine, advanced air suspension and ultra-stiff body structure, the Continental GTC displays the poise and dynamics of the Continental GT. In common with its stable mates is its interior. While sharing the familiar face of the Continental family, the design personality of the new Continental GTC is explained by Bentley’s design director, Dirk van Braeckel: “With the Continental GTC we set out to achieve a style that is both contemporary and elegant but with the sporting stance of a true performance car. We also wanted to ensure that the Continental GTC looks just as beautiful with the roof up as it does when it’s down. The Continental GTC becomes the second convertible to grace the current Bentley range. It follows the recently announced return of the evocative Azure name for Bentley’s Arnage-derived flagship four-seater convertible which goes on sale in Spring 2006. ^ Absolutely. This is a beautiful car. Top or no top.